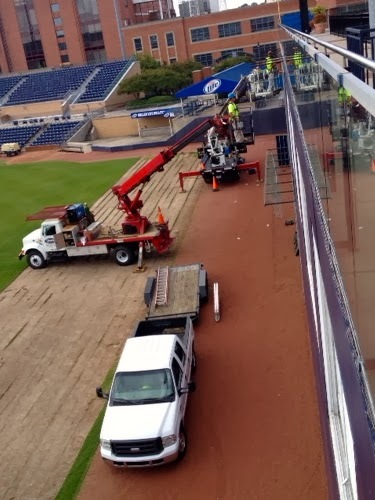 We have installed a new and improved, HD webcam overlooking the ballpark. You can watch the DBAP improvements take shape. Spy on installation of the new seats and the turf replacement project. The coolest feature is the time-lapse mode that's recording 24/7. Check it out and bookmark the URL. For the fourth time in this young century the Durham Bulls have won the Governors' Cup, the International League Championship. A 7-0 victory over Pawtucket Saturday night clinched a second Cup for Bulls' Manager Charlie Montoyo. (His first one came in 2009.) Read the game story at milb.com. This is remarkable to me when you think back to the 2012 season. The team went 66-78, and it included a brutal, historic losing streak. The Tampa Bay Rays told us it could be two years before the Bulls were competitive as top prospects moved up through the farm system. Under promise. Over deliver. What a turnaround! Finishing at .604 ...and at one point we had the best record in all of professional baseball, majors and minors. Bulls win the IL Championship Saturday night in Pawtucket. the 4th during his tenure. ONE MORE GAME: The Gildan Triple-A National Championship is Tuesday night, hosted by the Lehigh Valley Iron Pigs in Allentown PA. The Bulls will play the Pacific Coast League champions, the Omaha Storm Chasers. It's a one game, winner-take-all contest for the championship of Triple-A baseball on national TV. ...and 16 pitchers comprised a classic game last night in Pawtucket. The Durham Bulls are one game away from their fourth Governors' Cup Championship!!! Find out what a plate of tomatoes had to do with the victory. Read Adam Sobsey's report in Saturday's Herald-Sun. As I was watching this playoff video on YouTube an ad popped up for Ashford University. I thought it was part of the video because it said Achievement Belongs to Everyone. So true! Our superlative season really belongs to Durham and our fans across the Triangle. Join us at the DBAP. Let's try to squeeze a two more weeks out of the 2013 season. Got tickets? Achievement belongs to everyone! DURHAM, NC – The International League South Division Champion Durham Bulls today announce the promotional lineup for first round Governors’ Cup Playoff Games at the DBAP, presented by Sport Durst Automotive Group. The Bulls, who will face the IL West Champion Indianapolis Indians in the best-of-five series, host Game 1 on Wednesday, September 4 and Game 2 on Thursday, September 5. The return of the popular DBAP Food Truck Fest, a Craft Beer Rodeo, and rally towel giveaways highlight the first round event schedule. On Wednesday, September 4, eight of the Triangle’s most renowned food trucks will once again make their culinary specialties available during the DBAP Food Truck Fest: Playoff Edition. Participants at the DBAP Food Truck Fest: Playoff Edition include Only Burger, Chirba Chirba, Parlez-Vous Crepe, Sweet Stacey Cakes, BaguettAboutIt, Porchetta, The Humble Pig, and American Melt Down. Fans with tickets to the Game 1 will have access to all of the trucks, which will each have select menu items available for purchase at their locations along the Diamond View I concourse within Durham Bulls Athletic Park. Game 2 of the first round on September 5 will feature the ballpark’s first ever Craft Beer Rodeo, where fans will be able to experience an expansive selection of craft beers along the Diamond View I concourse. Once inside the ballpark, fans can sample and then purchase $5 tokens to enjoy pints from breweries including Anchor Brewing, Bear Republic, CBC, Cottonwood, Carolina Brewery, Foothills, Sierra Nevada, Sam Adams, Lagunitas, and Innis and Gunn. A portion of the proceeds from token sales will go to the Durham Bulls Youth Athletic League. The first 1,500 fans at each first round game will receive a complimentary Rally Towel, courtesy of Sport Durst Automotive Group. Both games have a scheduled first pitch of 7:05pm, with gates at the DBAP opening at 6:00pm. Single game playoff tickets are $10 for all seating bowl locations. Groups of 20 or more can purchase playoff tickets for $8 each. 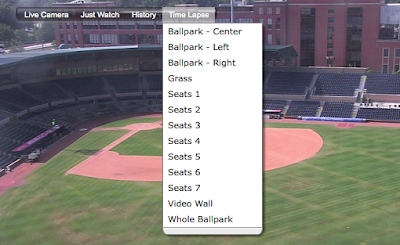 Tickets for the 2013 Governors’ Cup Playoffs can be purchased now at the DBAP box office, by phone at 919.956.BULL or online at durhambulls.com.